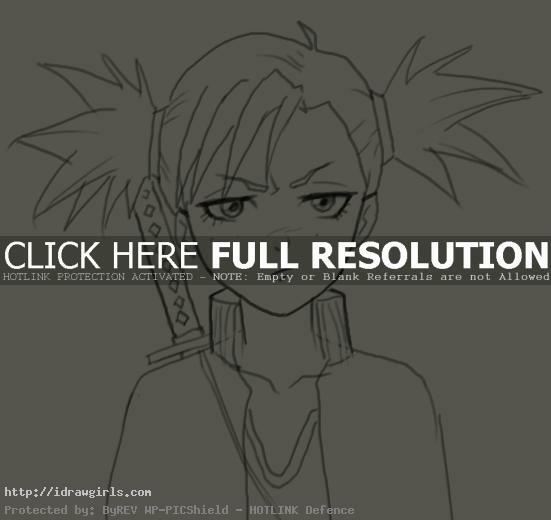 How to draw Hiyori Sarugaki from Bleach Manga. Learn basic drawing technique for Manga, Anime and comics from step by step basic drawing lesson. In this tutorial you will learn to draw a Manga character Hiyori Sarugaki with basic Manga drawing tips and technique for beginners. The easiest way to draw whether you are a beginner or pro is to observed your subject then break it down into simple shapes. I usually start drawing with simple geometry shapes to construct the basic Manga head and body. By following this process, you will find drawing is lot easier. The secret is to get the shape and proportion right in the beginning. Also make sure the shape of eyes, nose and mouth place in the accurate spot. I usually start of using sphere or circle as a base for character’s head shape, then next step would be figuring out the next geometry form to fit into the image. Hiyori Sarugaki, 猿柿 ひよ里, is the former Lieutenant of the 12th Division under Captains Kirio Hikifune and Kisuke Urahara, and currently a Visored. Hiyori is a very short, brown eyed, blonde-haired girl who wears her short hair in spiky pigtails. Her bangs are clipped together by three clips. Hiyori wears a white shirt and a red jogging suit, the latter with white lines running down from the shoulders and is additionally decorated with the first kanji of her name, as well as flip flops. Hiyori also carries her Zanpakutō over her back. On each cheek, under each of her eyes, she has three freckles. 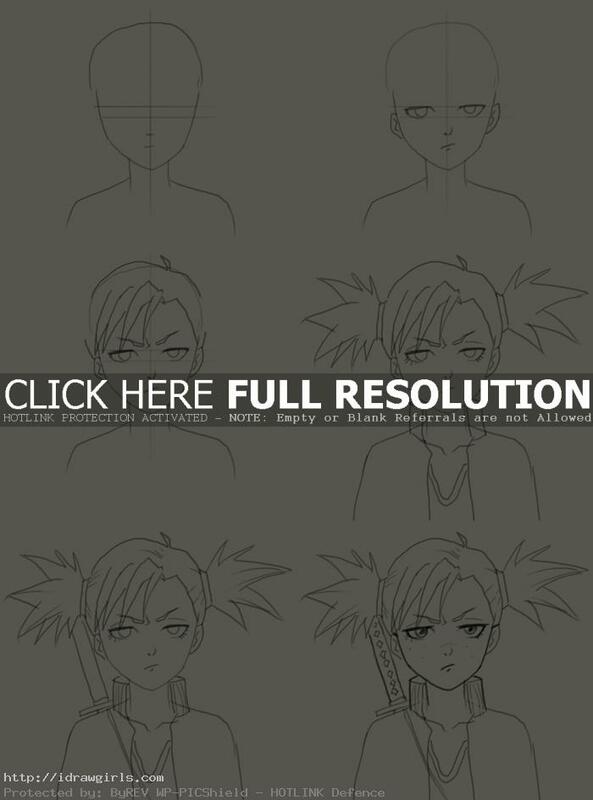 Below are step by step how to draw Hiyori Sarugaki. Step one, I drew a basic egg-like head shape and a few construction lines. Step two, I drew her eyes inside both horizontal lines. Then nose half way from eyes to chin, and mouth half way of that. Step three, I added her eyebrows, ears and her hair’s bang. Step four, I drew both her pig tails and jacket. Step five, I then added her sword. Step six, I add some additional detail and finished up the drawing.